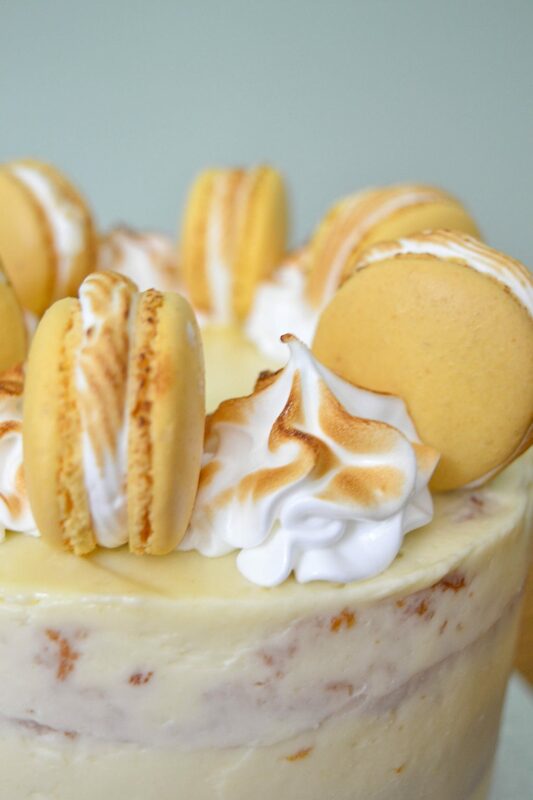 We love nothing more than converting much loved desserts into cake form! 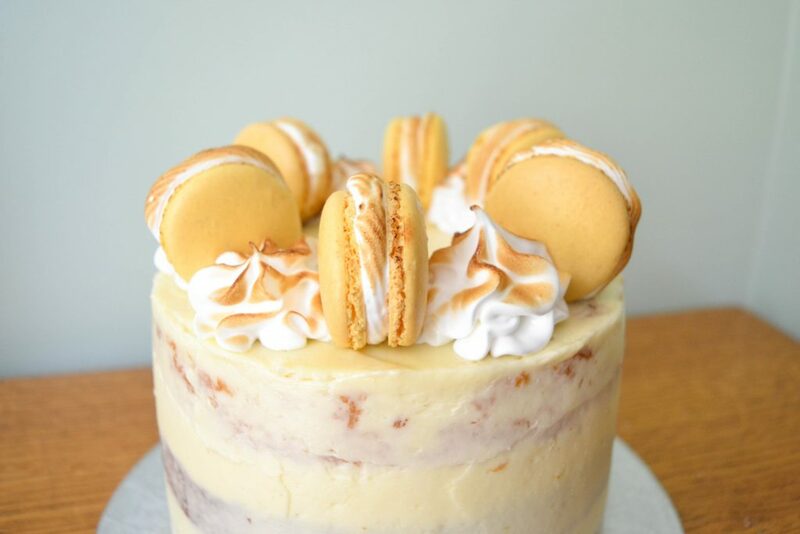 You may have seen that a couple weeks ago we posted a recipe for some seriously tasty lemon meringue pie macarons… well those lil beauties were to go on top of this lemon meringue pie cake! 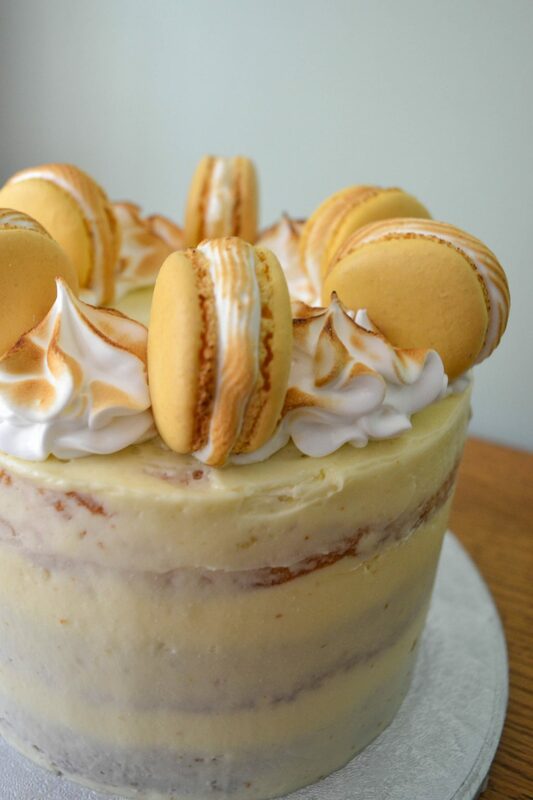 In order to truly encapsulate the tasty, classic pie into a cake form, we sandwiched layers of slightly lemon-y sponge with lemon curd and brûléed italian meringue! 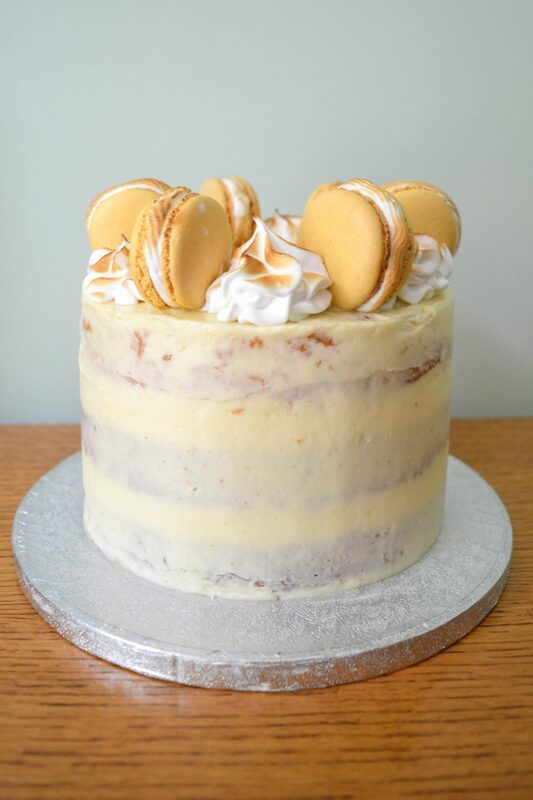 And then to ice the cake we of course could only use italian meringue buttercream, possibly the greatest thing you could ever cover a cake with, more effort than your standard buttercream, but boy is it worth it! After you’ve made the italian meringue, it’s as simple as whisking that until its cold, and we mean completely cooled, this bit is important. As the next step is to add softened butter and you don’t want this to melt! When you add the butter than you just carry on whisking for a few minutes, it may look curdled at one point but just keep whisking and you’ll get a smooth textured dreamy mixture. 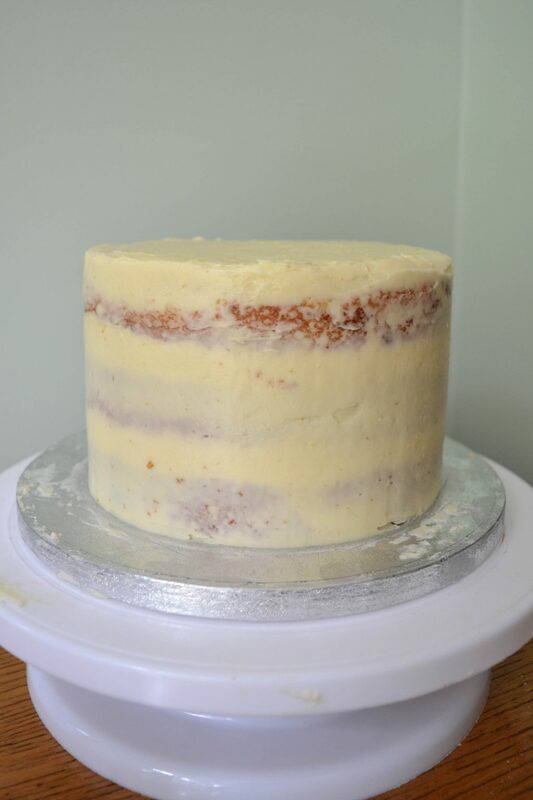 In between each layer of cake, we first gave a veeery light icing of the buttercream to stop the curd seeping into the cake and also piped a buttercream barrier around the edge to keep in all the curd and meringue. 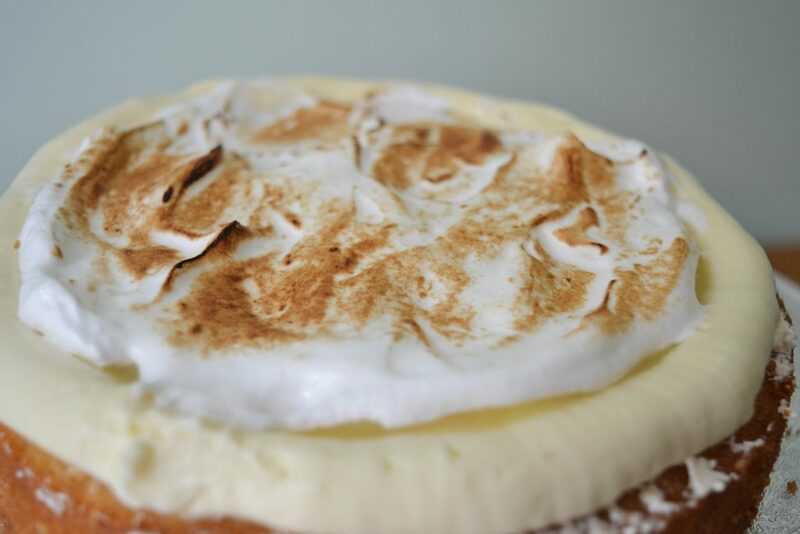 So once we had the cake covered and barrier in place we then piped in an even layer of curd, topped it with italian meringue which we brûléed with a blow torch to add that delicious browned meringue flavour. We did this to 2 of the 3 layers of sponge whilst all separate and then stacked our sponges, as we felt this was easier to do then fill, layer, fill, layer. Do what ever you feel more comfortable doing! 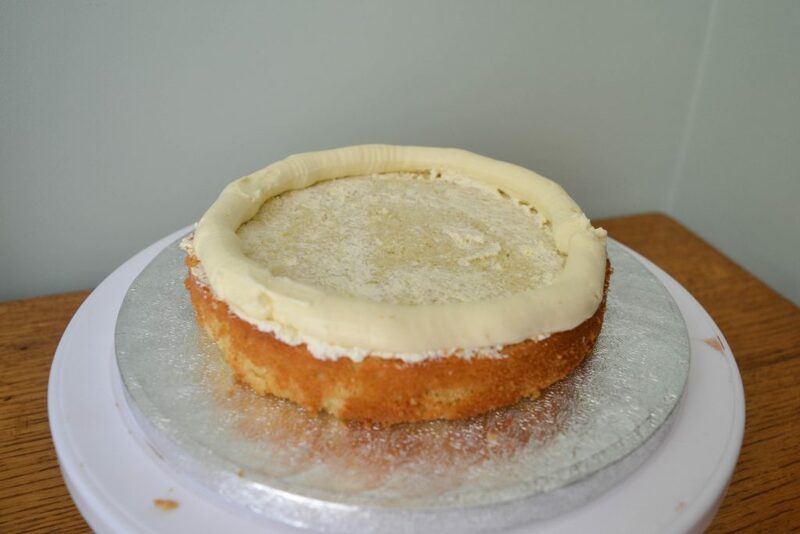 Now your cakes are filled and stacked, pop it in the fridge for at least 30 mins to firm up, then it’s time to ice, we felt that we wanted a semi naked style for this cake as seeking bits of sponge peek through was reminiscent to us of the pastry crust! But if you want to fully ice your cake, we certainly aren’t going to stop you! 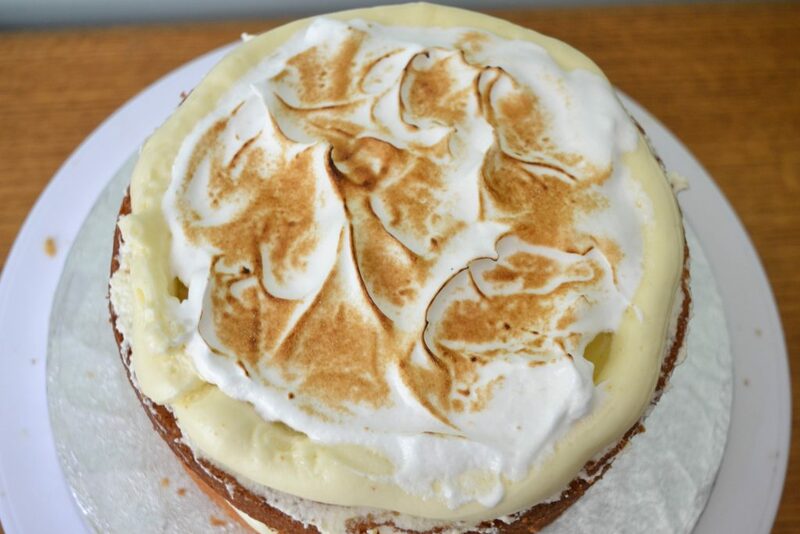 Then to decorate the top of our cake we wanted to keep it fairly classic and simple so we piped 6 large rosettes of italian meringue left over from filling our cake, which we brûléed because firstly it made it look pretty and secondly we love any excuse to use the blow torch! Then placed a macaron between each rosette! Cream the butter and sugar together until ight and fluffy. Add in one egg at a time, beatin to incorporate after each. Add half the flour and mix again, then add the milk and mix until fully combined. Add the rest of the flour, baking powder and the lemon zest and beat until well mixed and you have a smooth mixture. Spoon into 3 lined and greased 7" cake tins and bake at 170C (150C fan) for about 30 mins or until golden brown and a skewer comes out clean. Set your sponges aside and allow to cool completely. In a saucepan, whisk the sugar and cronflour into the egg until fully incorporated. Mix in the lemon juice, then add the butter and put the pan over a medium heat. Whisk continuously whilst heating the curd, it should thicken slowly, after about 10 mins you should have the consistency of a thick custard. In large bowl using an electric whisk or a stand mixer fitted with the whisk attachment, start slowly whisking the egg white. At the same time make the sugar syrup, place the sugar and water in a pan on a high heat, monitoring the temperature as it starts to bubble. One the temperature passes 105C turn the whisk to full speed to get the egg whites to stiff peaks. When the temperature of the syrup reaches 115C, remove from the heat and pour in a slow and steady stream into the egg white, continuing to whisk on full speed whilst doing so, then continue whisking until there is no heat at all left in the meringue, you can check this by placing you hands on the outside on the bowl and feeling if there is any warmth. This should take about 10 minutes. Once the meringue is cool, place in the softened butter and whisk for about 3-5 minutes until you have a smooth textured mixture. When the temperature of the syrup reaches 115C, remove from the heat and pour in a slow and steady stream into the egg white, continuing to whisk on full speed whilst doing so, then continue whisking for a couple of minute so the meringue cools a little. 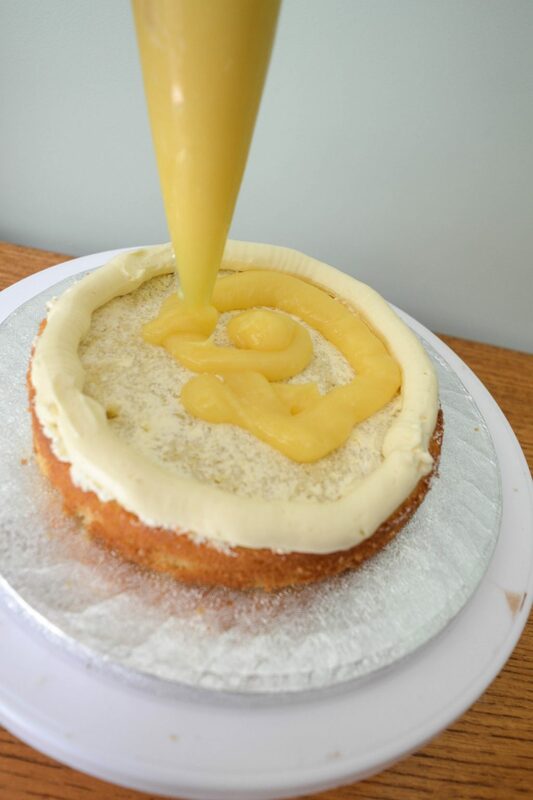 Pipe a line of buttercream around the edge of 2 of the sponges, half fill the centre with lemon curd and then top with italian meringue. Carefully brûlée the meringue to give it some colour. Then place on sponge on top of the other and top with the remaining third layer of sponge. Place in the fridge to firm up for at least 30 mins. 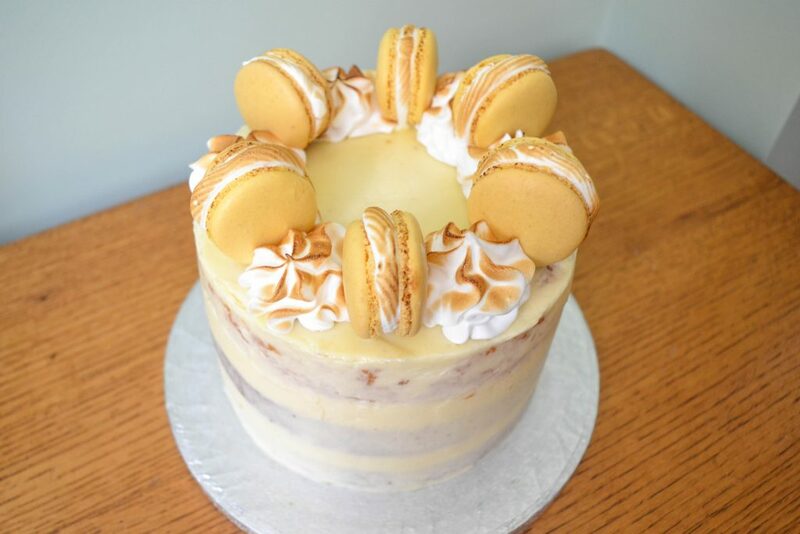 Ice the cake with the remaining butter cream and top with rosettes of italian meringue and macarons! 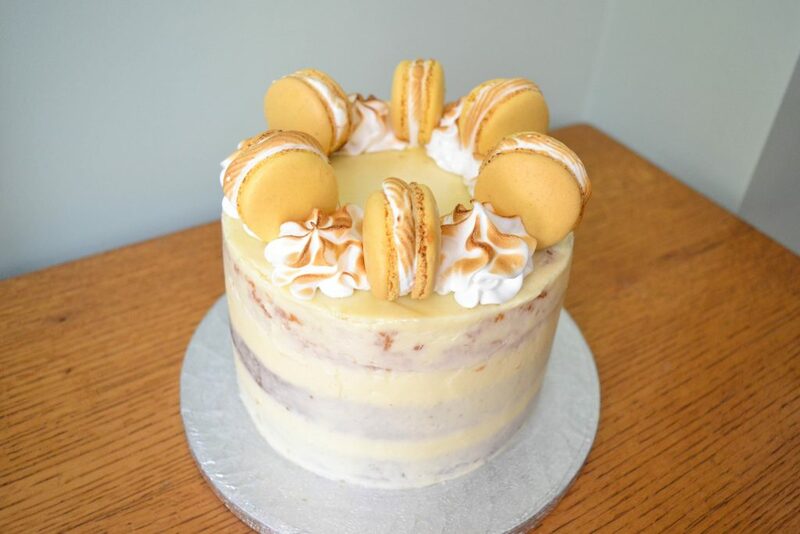 I am making this next week for my mums birthday and wondered how do you store it after you have made it and how long it will keep? I have never made meringue before so unsure how to store it. I’m trying to make this cake right now and I didn’t even realize before now that you don’t even have milk listed in the sponge cake ingredients! And you don’t mention the baking powder in the directions…. um… what am I supposed to do now that I’ve already used 4 eggs and all the flour and sugar! I’m going to look for another sponge cake recipe to get the milk measurement but I’m going to be so upset if I just wasted all those eggs ? A better cake with delicious taste is always on the top of priority list. 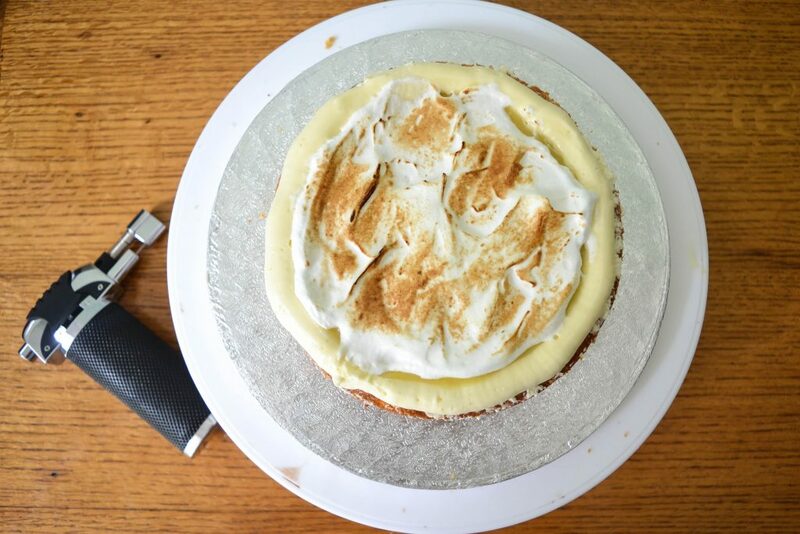 Seriously lemon meringue pie cake is best and you made it perfectly. 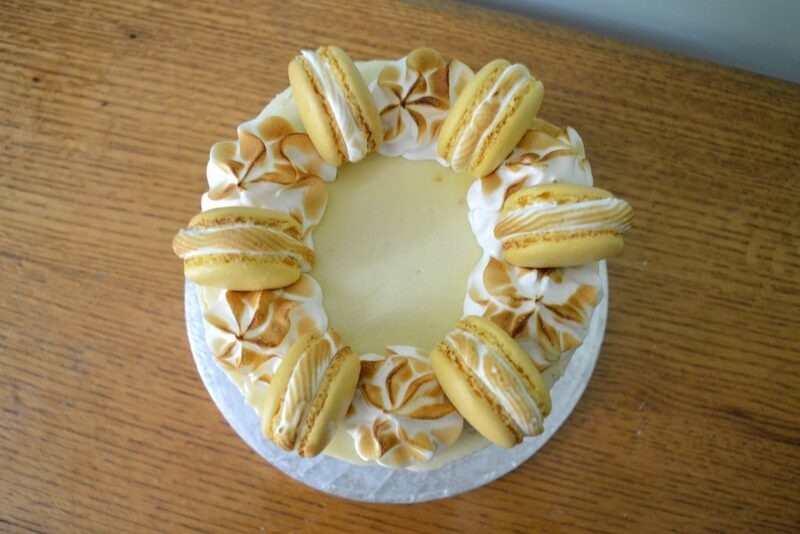 I love the idea of putting the meringue inside the cake – what a brilliant idea. I love the finish too, such a pretty cake.